I checked and with this post we complete the Kubus Kommunikaties label. Twenty four releases are mentioned in De Nederlandse Cassette Catalogus. 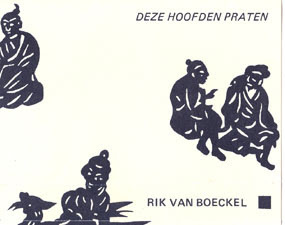 This was the first release by Rik van Boekel, a Dutch pop poet, with musical backing from Rob Smit (labelboss, De Kroonluchters), Harbert van der Kaap (also of De Kroonluchters) and others. 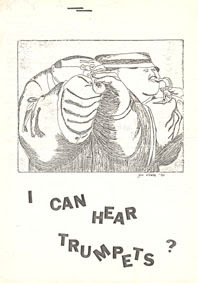 The title means 'These Heads Talking', and is a poem about the Talking Heads. To proof yesterday's point about De Kroonluchters, here's the second solo release by Rob Smit, Kubus' main man. He developped his own four fold musical universe, some musical theory about time, space and such like. 'Raakvlakken' is his release in which he expands the music he played with De Kroonluchters in more ambient pieces. Also included are two stories, by Miriam de Vriend and Miss Andeweg. Don't skip those, they are not long and the one with Andweg contains also ambient music. Slowed down organ sounds, very moody. 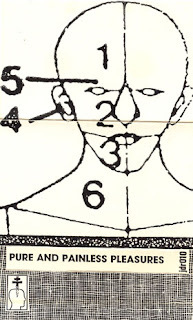 I never heard this tape until now, since I borrowed it from Dr. Freakowitz, but I made a lot of sense with regards to various other releases in the Kubus catalogue. 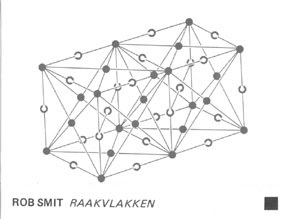 Some of these other releases are off shoot products from this, like Herbert van der Kaap's Vetraag De Tijd, various releases by Rob Smit, the Digit series. 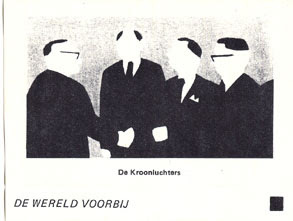 De Kroonluchters are less rock based, but more quiet, more improvised. Various of these pieces are the fundaments of the other releases. It also includes weird stories and some real songs. A mixed bag this one, but essential in the Kubus catalogue. Sometimes people complain that there is so little information on musicians, but its so hard to go by the cover. I am not sure if this tape is by Pand 33 and 'Staalwol' is the title or vice versa. Its funny that I borrowed a bunch of tapes from a unnamed friend and this one was part of it, while I also have a copy myself. Its quite alright experimental, electronic music. Maybe some conservatory students going wild? 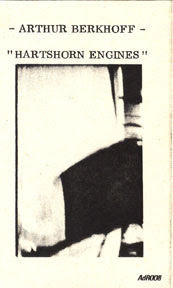 The predecessor of Nine Tobs, around vocalist Han Buhrs, from Arnhem. "NINE TOBS was an avant-garde band formed by HAN BUHRS, a longtime composer and vocalist on the Dutch and French music scene. Hailing originally from Arnhem and later moving to Amsterdam and Rotterdam, Han has been involved in many projects. Nine Tobs was one of these projects and their one-and-only album 'Gruffy Splurge' is a rare gem from the 1980s. Han's projects are always different and he always inserts an element of humour into everything he composes. Influenced by many genres of music, Nine Tobs' music is an eclectic mix of blues, jazz, punk and even disco but with an avant-garde bent. Han's lyrics are unique and his vocal style is always recognisable and distinct and perhaps an acquired taste to many." from the progarchives where you can read much more on Nine Tobs/Remo Tobs. This band started started in 1981, with various members of bands like The Torpedos, Slum and Zum Beispiel. Their first vinyl release can be downloaded here. It says the first tape was released by V.I.S.A. 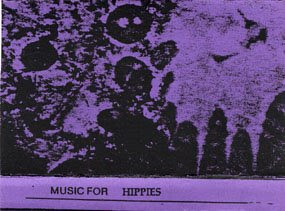 but I think this is the first tape, released on Decay Int, following some demo's. Not really my cup of tea this band, but I was also never a big fan of Birthday Party. There is also a book on the band, in Dutch only. check out their site. 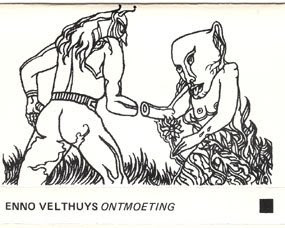 I posted some music by Enno Velthuys before, but in the box from Dr. Freakowitz there is some more. 'Ontmoeting', meeting in English, is another one he released on Kubus Kommunikaties, and continues his line of beautiful spacious synthesizer ambient music. If I'm not mistaken than this is the last release that I needed to post to complete this label on this blog. 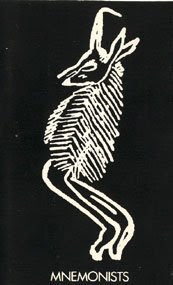 Fetisj, according to De Nederlandse Cassette Catalogus, published five tapes. And this is probably by one of the few artists who can claim (some) fame in a later world. Richenel is Hubertus Richenel Baars, who was a member of a disco group named Luxor, then singer and dancer, known for his androgynous apparence. He scored in the 80s a big hit with 'Dance Around The World'. His fame later on vanished, he moved to Spain, but apparentely a new CD will be released this year. This early tape already shows some disco influences, lots of synths and rhythms, all along whatever else the label released. A bibliotheek is a library, so this is music for libraries. I never understood why actually. I didn't like this tape that much, as it seems to be many 'just' tapeloops. Maybe there is a trance element that eludes me? 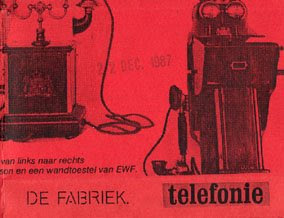 For the die-hard De Fabriek fans. Its not the music that makes this a classic release. 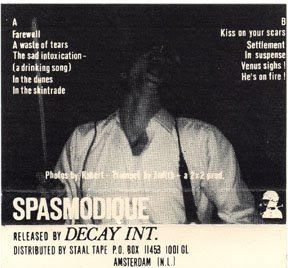 Rob Smit, the man behind Kubus, cleverly mailed this release out in 1980 to magazines announcing this to be the first independent released cassette in The Netherlands, and the start of Q Bus, which quickly became Kubus. He wrote these songs, performed them with some friends and looked for a record company. They thought this Dutch sung rock music was too weird, and then Smit released it as a cassette. A bit folky, rocky and weirdo lyrics. Dr. Freakowitz has two covers with it, the original 1980 release and the later cover when Kubus restyled the label. I scanned both. The bad news is that the tape deck from Dr. Freakowitz broke down. The good news is that he mailed me a box - the first of various boxes - with about thirty tapes to continue his contributions. And what a box it is, and the first I am postinv, is the last release by Kubus Kommunikations, by a band called Impact. This music has nothing to do with the music the label delt with before, good ambient and experimental music, but its plain, dumb hard rock. I guess Kubus wanted to give this a try, and when things didn't work, the label stopped. There is no catalogue number, so perhaps it might very well just a demo. 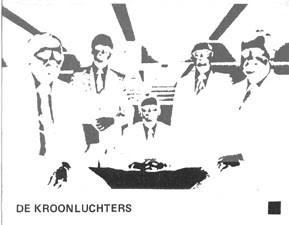 De Nederlandse Cassette Catalogus mentions kk 024 for this. 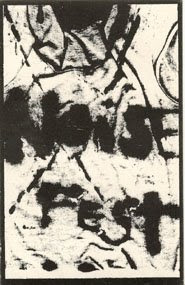 'Noise Fest was an art and music event at White Columns NYC JUne 16-24 1981. All material was recorded live at White Columns'. This includes John Rehnberger, Off Beach, Ut, Lee Renaldo, Mofungo, Khmer Rouge, The Problem, Smoking Section, Sonic Youth, Jeff Lohn, Ima, Jules Baptiste Red Decade, EQ'D, Avant Squares, Don King, Primivites, Ad Hoc Rock, Y Pants, Barbotemagus (as it is spelled on the cover), Economical Animal, Chinese Puzzle, Glorious Strangers, Built On Guilt, Fakir, Lampshades. Because the mansion is still not yet finished, a quick one: another fine tape by De Fabriek, this one recorded with one P. Funk. And this one has music by Djo Le Chien, David Prescott, Minoy, Robert Poss, Illusion Of Safety, Jack Wright, Violence And The Sacred, Eugene Chadbourne & Jon Rose, Nicolas Collins, Thick Slimy Whisper & Qwa Digs Never Parish, Kurt Kelison, The Iniutive Bikers, Paul Dutton, Not Half, David Lee & David Prentice, Crash Worship, P16.D4, Brewlay Brothers, Zo Darsh. According to Discogs a pretty rare tape, probably around fifty were made. Its has a printed cover however. "Mnemonists is a collective of avantgarde musicians from Colorado, lead by Mark Debyshir and Bill Sharp. Their music is a crazy mixture of modern classical, experimental sounds, noise, industrial, avantgarde and free jazz. Their releases were published by their own self-produced label Dys between 1981 and 1986. In 1987 the group changed its name into Biota." This tape uses small-battery powered devices, tapes, voice, string instruments, clarinet, percussion. Unindexed. The Oracular Editions (OED) cassette label, dedicated exclusively to the spoken word, has just released Oracular Editions #1, an audio anthology of spoken word performance, audio art, soundtexts, poetry readings, etc. 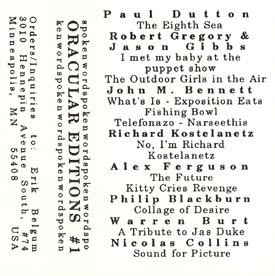 Oracular Editions #1 contains works by Paul Dutton, Robert Gregory & Jason Gibbs, John M. Bennett, Richard Kostelanetz, Alex Ferguson, Philip Blackburn, Warren Burt and Nicolas Collins. Price: $10 (includes shipping). 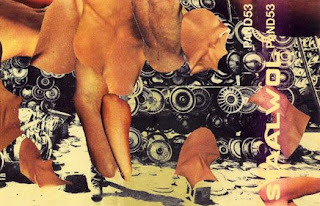 In addition to the ongoing series of audio anthologies, future projects include a series of experimental short stories produced for radio and a series of documentary tapes covering often discussed, but seldom experienced, natural language phenomena such as glossalalia and Tourette's Syndrome. Editions, 3010 Hennepin Ave. South, #74 Minneapolis, MN 55408 USA. And today is the second birthday of this blog. Will there be a third? I honestly couldn't tell, but various people have offered their collections (parts of) so it may exist a bit longer than I would have thought. 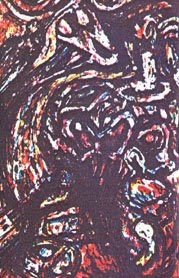 Another fine tape by Arthur Berkhoff, see previous posts for more information. This is another fine tape of voice and electronics. The first piece was also on Korm Plastics' 'Katacombe Vol.3'. I am not sure if I indexed it right, though, especially the b-side was pretty difficult. I know I said something about double posting, but there is a good cause to bring these two your attention. A while ago I bumped into Harold Schellinx, whom I never met and told him his music and writing was always a great inspiration and he sort of sussed that I did this blog. He gave me physical copies of these two records on his Amphibious Records label, and asked me to post them, as a sort of add for the fact that they are both for sale from him. So ignore this download altogether and go straight to here to buy them. A pretty useless post, this? Maybe you never heard of them, and you want to check it out first too? Go ahead. The Pump was the forerunner of Nocturnal Emissions. 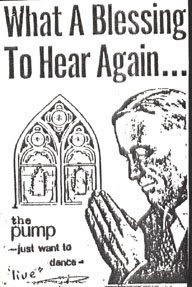 Nigel Ayers says on his website about this: "The Pump was an experimental music group I'd formed in 1977, with my brother Danny and Ian Round. Lots of heavy bass and guitar distortions, cut-up tapes. 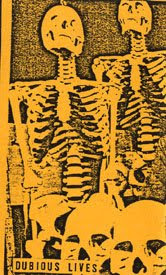 We did 4 or 5 cassette-only releases - only about 30 copies of each. The first batch were copied at home onto the very cheapest tapes I could find on Brixton Market - you'd be lucky if you could get them to play more than once. Rough Trade bought them though, and that just encouraged me to seek out even cheaper ones for the next release. 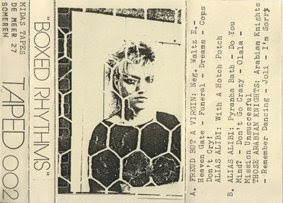 A few years later someone sent me a review Masima Akita of Merzbow had done of one of these tapes for a glossy magazine in Japan. I've no idea how he got hold of it. The line-up for this show was myself, Caroline K, Harry Turner and Jo Greenman. "The Pump was way ahead of its time. Certainly way ahead of the students at this art school gig, who pulled the plugs on us after 22 minutes because they couldn't figure out how to dance to it." That's about one of the two Pump tapes in this zip 'Just Want To Dance', a twenty two minute tape released by Sterile Records (src 2, 1980), Ayers own label. 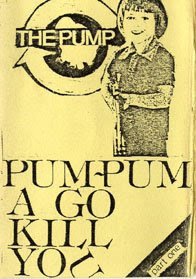 Also included is 'Pum-Pum A Go Kill You Part One' (pump 4, 1980), which, perhaps to Ayers surprise still plays in 2009. I have decided to make anonynmous comments impossible, as I am fed up with all those people that write as a comment 'track 4 is missing !!!!' - just send me a nice e-mail to fix it. This is a hobby, not a supermarket where you demand service. If you are, I'm nice. Following last week's tape by Unit 6/SMtv, which I assumed was MTVS from EIndhoven, DMDN from Midas Music gave me some more Zesde Kolonne tapes, all by MTVS. This is the first of three, called Back Pigs and according to the cover their fourth official release. I believe MTVS was a duo and main men behind Zesde Kolonne, as said from Eindhoven, The Netherlands. Zesde Kolonne still exists to this very day as a cultural organisation, but it seems dull to me, regular art stuff although the music player has the old stuff playing. They are looking for a tape that I posted before, 'Zwoek', and I told them I have it, but they never bothered to reply. Oh well. Their music was quite industrial, maybe a bit Etat Brut like. From Wikipedia: The band was formed by former Fatal Microbes Pete Fender (Dan Sansom, guitar), Gem Stone (Gemma Sansom, bass) and It (Quentin North, also bass), with vocalists Annie Anxiety and Womble, and drummer Sid Ation (born Sid Truelove, 18 April 1960, Sutton Coldfield, a former chef, later also the drummer with Flux of Pink Indians). Annie, Womble and It were involved only initially, left and were replaced by vocalist Zillah Minx (born Zillah Elaine Ashworth, 31 March 1961, Birkenhead). Fender and Stone were the son and daughter of Poison Girls singer Vi Subversa. 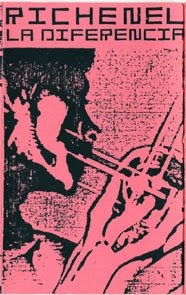 The band used Poison Girls equipment to jam and write songs and their first performance was when they took to the stage at a Crass/Poison Girls concert. They had originally been called Rubella Babies. The band's first proper gig was a fundraiser for the Theatre Royal in Stratford, which ended in a riot, and the band played frequently, often asking audience members to put them up after gigs. The new line-up were soon known for wearing brightly coloured dayglo clothes on stage, to differentiate themselves from the anarcho-punk bands who tended to wear black, 'army-surplus' style clothing. Pete Fender left at the end of 1982 and soon afterwards joined Omega Tribe as a full-time member, having been their early mentor and record producer. 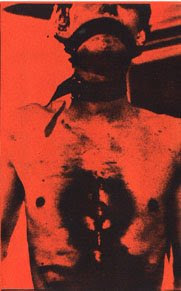 The band released one album on cassette tape, entitled Ballet Bag (1981) and a 4 track 7" EP, Ballet Dance (1982), both for Poison Girls' XNTRIX Records, after rejecting the opportunity to put out a record on the Crass label. Adrian Thrills, reviewing the single in the NME stated "the Ballet have an appealing sharp edge to their claustrophobic punk thrash, a poppy surge and even a discernable funk readjustment...of course, they could always just be taking the piss". After releasing the 42f single on Jungle Records (with Sean replacing Fender) the band started their own Ubiquitous label. 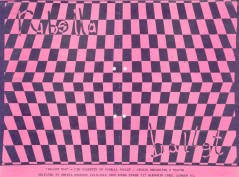 Rubella Ballet toured extensively with Poison Girls and Crass, and recorded two John Peel sessions for BBC Radio. 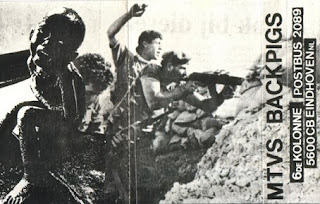 In 1984 they embarked on an ill-fated tour of Italy to promote 42F. The band had only been given single airline tickets and after a week of playing without getting paid, they returned to England by train. The band's line-up underwent several changes before their next release, "Money Talks" (1985); Sean and Gem had left, to be replaced by Adam and Rachel Minx (Zillah's younger sister Rachel Irene Jane Ashworth), and Adam himself has replaced by Steve Cachman prior to the recording of the debut album At Last, It's Playtime, the same year, an album that has been described as "chugging mid-paced stuff, many of the tracks dominated by Zillah's steamroller-flat vox". The line-up stabilized over the next few years, the band recording a second album, If... in 1986. A compilation and a double live album followed, but it would be 1990 before the next studio album, At the End of the Rainbow. 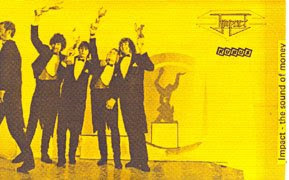 The band split up shortly after its release, Sid already playing in the dance band Xenophobia. In 2000, the band reformed for a performance at the European Gathering festival in Milton Keynes, and have continued on and off since, with the core members Sid and Zillah joined by a varying line-up including original guitarist Fender. A retrospective covering the first half of the band's career, Anarchy in the U.V., including Ballet Bag, Ballet Dance, At Last It's Play Time, the 12-inch version of "Money Talks", and two previously unreleased tracks, was released in December 2008. A second volume is planned for release in 2009. Another one of those weird De Fabriek releases, with not much information on the cover. It deals with telephones. But is that enough to go by? Of course I think its a nice enough! The most important Radioshow when I was young was not John Peel, nor Radionome but Willem de Ridder's Radiola Improvisatie Salon. He would play any tape with music sent to him. During the show he would rip open the enveloppe, read whatever note, and then, without any prelistening, play the tape for five minutes. If you sent in a tape, you'd got the newsletter and could take part in action's, which I never did. The radio station, VPRO, also released one tape, which at 20 guilders, was quite expensive I thought. No real cover and two sheets of info which didn't fit in the box. A louzy job. Veldman later on worked on musical projects with Willem de Ridder as FNTC. 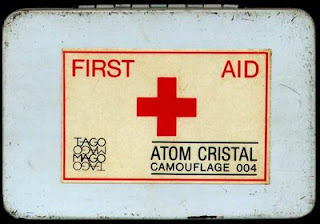 In the very early days of this blog I posted the first tape by Atom Cristal, together with Satellite, here is their second tape, packed in a small first aid kit. I think I saw this somewhere but it was unindexed, so I did a new rip, indexed. I used their photos though. 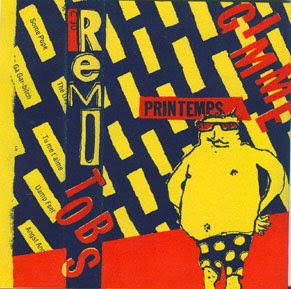 Nice popmusic from France. The biggest I reckon until now, this is five tapes of each one hour. 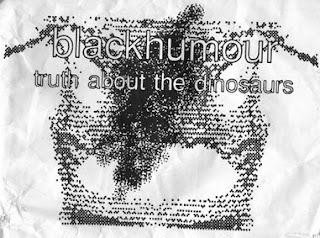 It deals with the pamphlets by one Ed Taylor, with the truth about dinosaurs. Its all explained in the texts that I also scanned. I posted music by blackhumour before, and this is a sort of mixture of the old stylewith long formed ambient like drones and cut up/collage spoken word. Very nice. No less than 3 people left a comment about a fault in the first zip, so i re-upped that in part 1 and 3. but please, why doesn't anyone send me an e-mail about broken links? 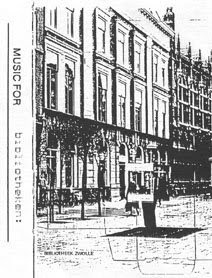 It is been quite a while that I posted stuff released by Eindhoven's Kaisettes label, also known as Zesde Kolonne. Here's one which I borrowed of yet another friend, who gave me some more nice stuff which I'll post soon. I have no idea who was behind Unit6 but it seems to me that SMtv is anagram of MTVS, who were in the previous post and of whom I'll post more stuff soon too. Quite noisy and industrial. Probably my least favorite record with Richard Youngs, which he recorded with Neil (Campbell), Simon (Wickham-smith) and one Stewart (Walden). A highly chaotic and improvised music affair, but may you like it more than I do? A very early compilation on Midas Tapes featuring only bands I never heard of afterwards: Freud But A Virgin, Alias Alibi and Those Arabian Knights. All have more tracks and its mainly guitar/punk oriented music. I got these MP3s (all of the Midas stuff I am posting these weeks) years ago from Mr. Midas, and they are all 128 kbps, which is the way it is. No need to write comments: hey man, 128? its 2009, you know (usually followed by that horrible word 'dude').